In today's market, many products attempt to attract buyers with countless features and unusual forms. Made out of only three assembly parts, Lumu has everything it needs and nothing more. Thanks to its aluminum unibody it will last for many years. Each device is assembled and tested by hand. Only well-executed objects can be really valuable. 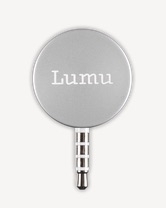 Making it even more user friendly, Lumu comes with natural leather Lumubag and Lumuneck. This way, it is protected in all situations and can be always with you. The whole Lumu experience was made with clearly defined objective: to create a tool that places the sheer joy of photography.